Today, I’m kicking off a new weekly series, in which I break down the self-publishing process, one chunk at a time. Welcome to our first lesson! This week is all about determining if the indie route is best for you, and if you’ve got what it takes to make it work. Naturally, the first step in your journey is to decide if self-publishing is really the right option for you. Self-publishing is ideal for smaller, more personal projects: For instance, if you’re writing a family history or a memoir to share with your family, then you’d be best served by self-publishing that bad boy and producing enough copies to go around. A project like that just isn’t suited for traditional publishing, or even a small press—but if your dreams are a little bigger, you should weigh all your options. Let’s explore those options together. Until very recently, there was a serious stigma attached to self-publishing: Only lousy writers who can’t get agents resort to self-publishing. All self-published books are poorly-written and poorly-edited. Self-publishing is embarrassing, and just isn’t a viable option for serious writers. And then, of course, Amanda Hocking made headlines after selling a million copies of her self-published books and landing a sweet deal with a traditional publisher. A slew of other self-pubbed authors have sold like crazycakes, landing on bestseller’s lists. On top of that, more and more bestselling, traditionally-published authors are self-publishing some of their work, such as Rachel Aaron and Beth Revis. It’s become clear that self-publishing isn’t just for failed writers, and that not all self-pubbed books are terrible. Anyone who tells you otherwise just doesn’t know much about self-publishing. So who self-publishes? Everyone from established, New York Times bestselling authors to first-time authors who have no previous publishing credits. Maybe even you! 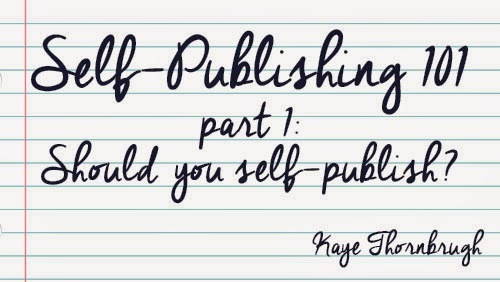 To get started, let’s break down some of the biggest pros and cons of self-publishing. Extreme flexibility: As a self-published author, you have the freedom to change up your strategies and find an approach that works for you. If something’s not working—be it cover, content or something else—you can change it at any time. Higher royalties: You’ll keep as much as 70 percent of the royalties brought in by your ebooks. For example: I sell my ebooks for $2.99, and make about two bucks from each sale. It may not seem like much, but when you’re making steady sales, it’s amazing how it all adds up. Own all your rights: Pretty much what it says on the tin. When you self-publish, all of your rights stay with you, the author. Set your own schedule: You’re the boss here, which means that you decide what does and doesn’t happen with your book. For example, some authors like to simultaneously publish both digital and print editions, so readers can always find their books in a preferred format. Other authors hold off on producing a printed book until their digital edition “earns out” and they feel confident that they’ll sell enough print copies to make it worth the added expense. Likewise, you might not want to produce an audio book right away, but you can always tackle that at a later date if you change your mind. See? That’s one of the beauties of self-publishing: You can mix and match. Complete creative control: When you self-publish, you have total control of your book—the title, the cover, the content, the price, everything. For many indies, this is the bottom line and the main reason why they choose to self-publish. Editing: In addition to your critique partners, you’ll have to find and hire a professional editor. Make sure to do your homework for this part: Any editor you hire must have experience, references and examples of previous books they’ve edited. Formatting: You have the option of formatting your digital and print editions yourself. I do this part myself, but I’m lucky in that I have a skill set that includes expertise with InDesign, which makes formatting my paperbacks a straightforward process. If you don’t have the previous experience that I do, you’ll probably need to hire someone else to format your book for you. Again, do your homework and make sure that whoever you hire is professional, experienced and has examples of their previous work. Paying your own expenses: Any services that you pay for—editors, designers, book-promotion (including booking blog tours, printing bookmarks and fliers, etc. )—will have to come out of your own pocket. Of course, even most traditionally-published authors have to pay for most of their own expenses, so at least you’re in good company! Why self-publish when you can try to be published by a small press? Won’t you be better off with a small press, instead of flying solo? This is a question that many writers ask—and, indeed, the answer for some is working with a small press. As we know, self-publishing is a lot of work. A small press, however, will do the brunt of the work for you: professional editing, cover design, digital and print formatting, and distribution. You won’t have to worry about procuring any of these services for yourself, which means you can focus your efforts elsewhere—say, on writing your next book. However, like self-publishing, working with a small press has both pros and cons. Which one is right for you? Really, it’s a matter of priorities. You have to decide what’s most important to you and then go with the publishing route that offers the most of what you want. In my experience, many new writers publish with a small press because they see it as a more “legitimate” form of publishing. They want to feel that they are “being published” by someone else, because it gives them a sense of validation. And that’s all right, if that’s what makes them happy! If being able to say “I’ve been published” is of paramount importance to you, then you’ll probably be happier with a small press than with the self-publishing route. However, if the ultimate success of your book is most important to you, then you’ll want to weigh your options carefully. A small press may not be your best option. Can this small press do better for me and my book than I can do for myself? 01. Are they professional and trustworthy? What is their reputation? Do your homework. Ask around. Post in forums like AbsoluteWrite to find other writers who have published with them in the past. Are those authors satisfied with their experience? 02. Will they pay me an advance? Some small presses don’t, simply because they cannot afford to. 03. Are their covers eye-catching and professional? Many small presses have talented cover designers on staff—but not all. Check out the books they’ve published and make sure the covers don’t look amateurish. A bad cover will kill your book. 04. Will they publish my books both digitally and in print? Is this important to me? Some small presses are digital-only. Other presses guarantee both print and digital publication, and still others only publish a title in print after it sells a certain number of digital copies. Decide what is important to you. Some authors don’t care about a print run, but if you dream of holding a printed copy of your book in your hands, then make sure the small press you sign with will provide that. 05. How will they promote me and my books? Will they provide promotional materials (such as bookmarks) or will I have to obtain these materials myself? Most authors, even those who are traditionally-published, have to do at least some of their own promotion, but even a small press should promote you in some way. Again, consider what’s important to you: How much legwork are you willing to do? Are you comfortable with that? 06. How will they distribute my books, and to what retailers? This one’s pretty self-explanatory. Make sure the small press will get your book where readers can find it. 07. How much do they sell books for, and what will be my cut? Many small presses price their digital titles at less than five dollars. Royalties vary from press to press, but more than likely, your cut of each digital sale will be quite small. Considering you’ll probably be doing most (if not all) of your own promotion, do you feel that everything else your publisher provides—editing, cover art, formatting, distribution, etc.—will be worth the trade-off of a small royalty? 08. Do I like the books they publish? Read a few of their current titles. How’s the editing? How’s the formatting? Is the story any good? Would you feel proud to have your books on the shelf alongside this publisher’s other titles? Here’s my take: Personally, I’ve yet to find a small press that I believe can provide better services for me than I can procure for myself. However, it’s worth noting that I am in something of a unique position here. I have the ability to design my own covers and do all my own formatting (both digital and print), and then end up with high-quality, professional product. I have to do my own promotion, of course, but if I were published through a small press (or even through a big publisher), I’d have to do most or all of my own promo, anyway. Because of this, I’m sticking with self-publishing for the foreseeable future. For me, the benefits of self-pubbing—such as owning all my rights, earning a 70 percent royalty on ebooks (which comprise the majority of my sales) and having complete creative control—outweigh the benefits of publishing with a small press. For you, that may not be the case. By now, I hope you have a better idea of whether the self-publishing route is right for you. Really, it all depends on your goals. And remember: Even if you choose to pursue a different publishing route now (such as a small press), you can always give self-pubbing a try in the future, and vice versa! That’s the beauty of self-publishing: You always have the option of changing things up. If you’re sticking with the program, congratulations! Self-publishing is a very exciting journey. Check in next week (self-publishing Saturday?) for a new lesson in Self-Publishing 101. NEXT WEEK: What you need before you self-publish!